April 24, 1999: Is Central Terminal worth saving? 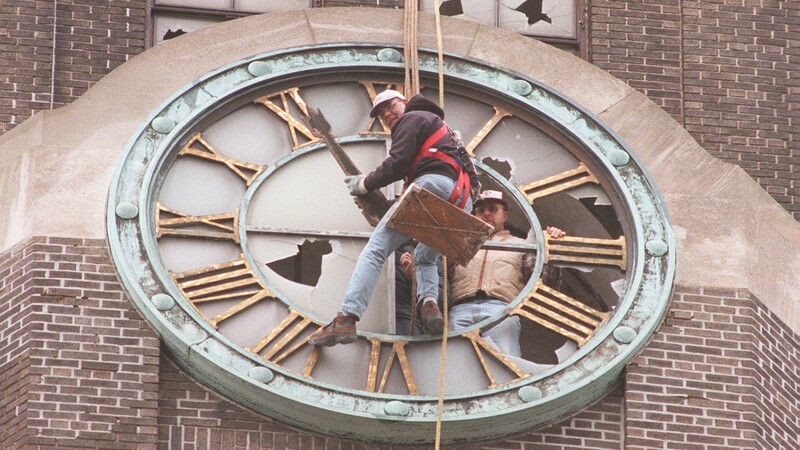 "Jeff Ingersoll swung in the raw wind outside the broken face of one of the New York Central Terminal clocks Friday, marking the start of a $15,000 project to restore time to the old landmark. "Ten stories below, his admirers on the ground -- a half-dozen preservationists and East Side activists -- pointed to Ingersoll's volunteer assistance on the clock restoration project as another example of the loyalty many people have for the building." Steve Cichon – Steve Cichon, communications professional, pop culture historian, and publisher of BuffaloStories.com, tells the stories of Buffalo's past through The News' BN Chronicles. He is a local radio and TV veteran, historian and author of five books.